Oh my! You guys this jam is so tasty! Our strawberry patch has produced so many berries this year and I’ve been having fun thinking of new ways to use them up. 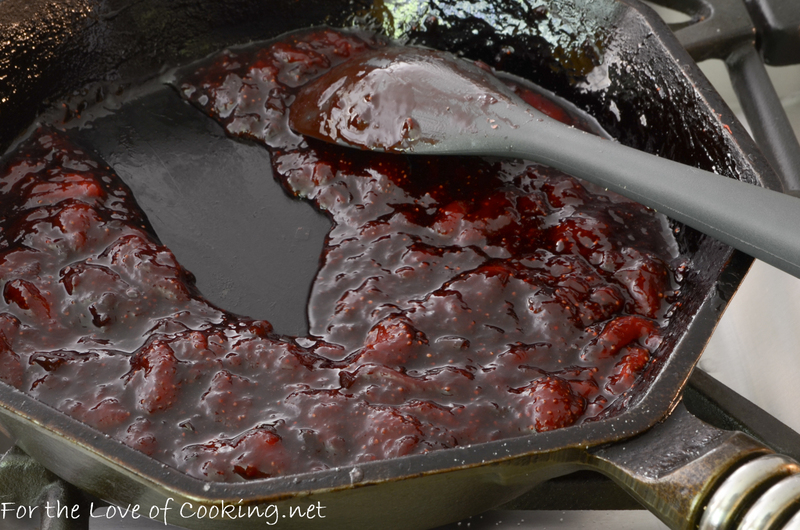 I picked a bowlful yesterday afternoon and made this skillet strawberry jalapeno jam. My family loves spicy fruit jams with soft cheese and warm bread so I knew this jam would be a big hit with all of us. I only used half a jalapeno because my son doesn’t love super spicy food and it still turned out with a nice kick. After I filled the jar, my daughter ate every last bite left in the skillet. 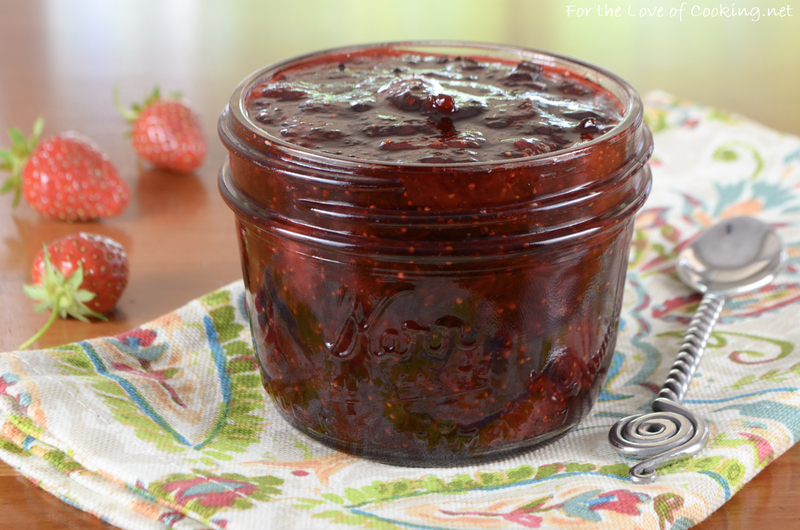 This strawberry jalapeno jam turned out sweet, spicy, and so delicious! I have big plans for this jam – stay tuned. 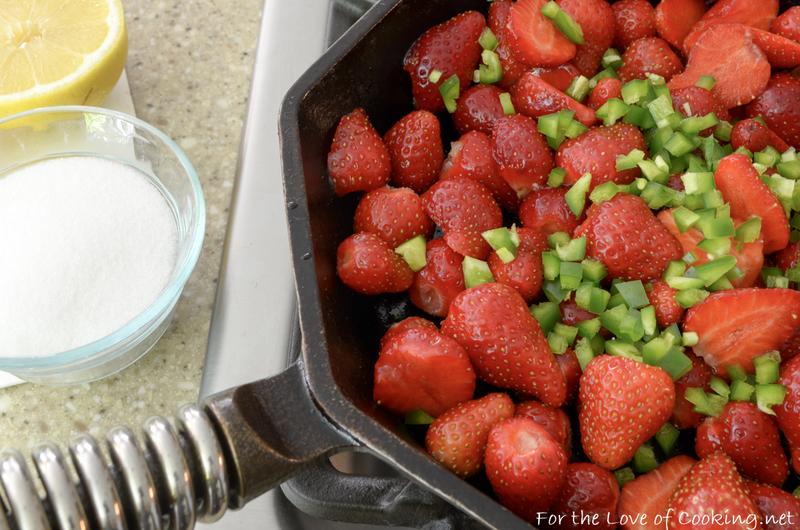 Place the strawberries, jalapeno, sugar, lemon zest, and lemon juice together in a large cast iron skillet over medium heat. Cook, stirring often, until the berries and liquids have reduced down to a thick jam, about 20 minutes. It’s done when a spoon pulled through the jam leaves a path in the skillet. Cook, stirring often, until the berries and liquids have reduced down to a thick jam, about 20 minutes. It's done when a spoon pulled through the jam leaves a path in the skillet. Pour into glass jar and allow to cool. Cover with a tight lid and store in the refrigerator for a week. Sweet and spicy…definitely my flavour combo. YUM! Totally new idea for me. 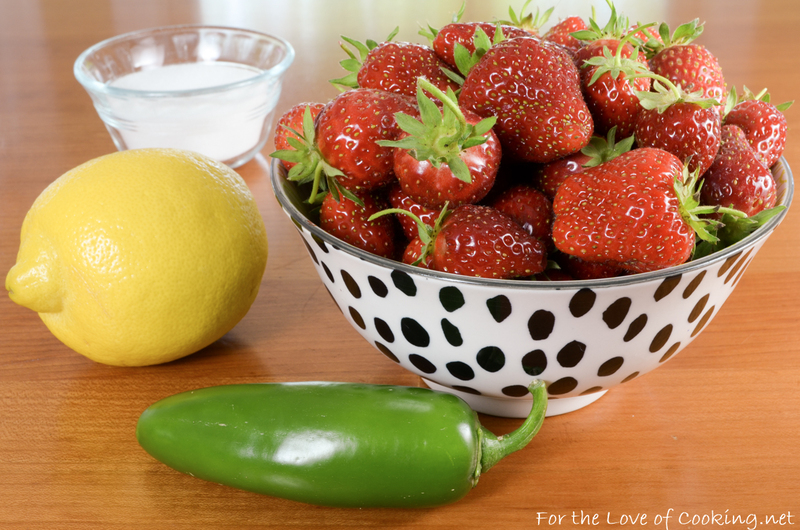 Jalapeno in my strawberry jam. Can’t wait to see what the big plans are! Definitely printing this one for canning! 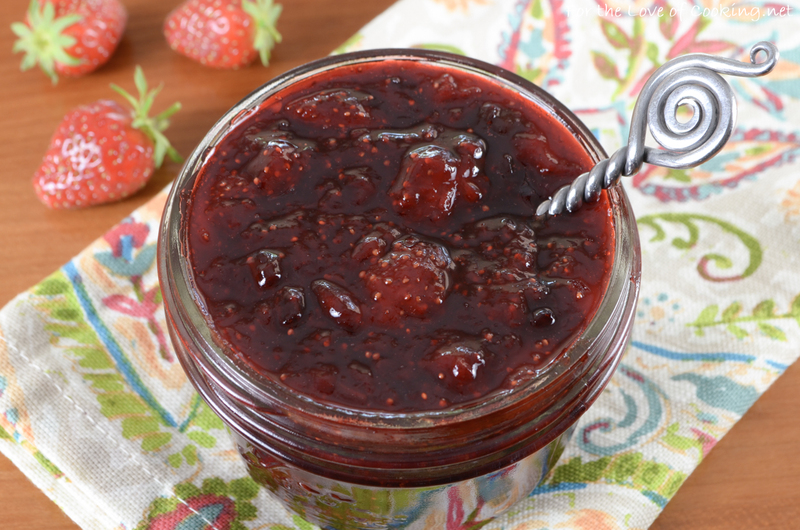 I love, love, love strawberry jalapeno jam! Can’t wait to try this! Sounds wonderful. But just so you know your recipe includes the directions with the jalapenos but in your write up it is left off. I was a bit confused. But I guess only matters in the recipe print. Thanks for letting me know… I have corrected it. I love the spicy twist in here! 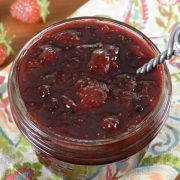 Just a question- new to canning- is it only good for 1 week? Or store in fridge for a week -then what? Just keep an eye on it and the inside of the lid. If you see mold, it’s time to throw it out. Mine lasted only a couple of days because we devoured it. Can I make this recipe using frozen strawberries? I have never tried using frozen strawberries but I don’t see why not. Let me know how it turns out!